In isolation, the Kia Forte sedan does come across as a fairly good and likeable compact car. After all, it’s straightforward to drive, is quite spacious, offers decent value for money and has one of the best warranties you’ll find in this class. However, cracks do start to show when you cross-reference the Kia Forte with its rivals. In comparison with its more accomplished competitors, the Kia Forte can’t quite match them in terms of ride quality, and the Kia Forte can become quite pricey at higher trims. Overall, we do reckon the Kia Forte sedan is a good car that we’re sure will appeal to some compact sedan buyers. However, as there are better overall vehicles in this segment, we can’t quite recommend you buy a Kia Forte before trying out other alternatives. The Kia Forte manages to have the kind of space that can be found in rivals like the Toyota Corolla. Even though it’s a compact sedan, the Kia Forte manages to have the kind of space that can be found in rivals like the Toyota Corolla. The doors on the Kia Forte are oddly-shaped, which makes getting in and out of the car not as streamlined as it would be with the Ford Focus or Honda Civic, but there’s plenty of headroom for taller people in the front and back seats – though leg room in the back is a bit tight. The one thing that isn’t modest inside of the Kia Forte is the massive and easy-to-use touch screen that takes up a lot of the dashboard. The Kia Forte boasts a trunk about 15 cubic-feet large, which is big for its class. The materials used in the cabin aren’t top grade, but they’re not cheap-feeling either, and the plentiful use of soft touch plastics is a pleasant touch. The Kia Forte boasts a trunk about 15 cubic-feet large, which is big for its class (the Ford Focus and Toyota Corolla both have 13 cubic feet trunks) and is enough to contain a few large-sized duffle bags. A long list of features is available for the Kia Forte’s interior, including Bluetooth and a USB port. For sure, it’s responsive and grippy enough for day-to-day driving. 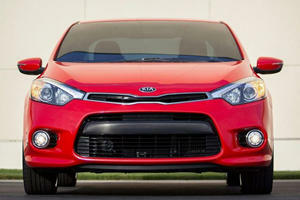 Buyers who want their compact sedan to be fun-to-drive will be disappointed with the Kia Forte. For sure, it’s responsive and grippy enough for day-to-day driving, but it’s not going to put the driver at the edge of their seat. The Kia Forte also suffers from severe body roll, which isn’t present on rivals like the Ford Focus and Mazda 3. The ride is a bit harsh, and even more so on the sports-tuned suspension that’s available on the mid-range trim. The visibility in the Kia Forte is good by class standards. The visibility in the Kia Forte is good by class standards, as a result of good-sized mirrors, large windows and pillars that aren’t too chunky by class standards. The bottom line about the Kia Forte on the road is, it feels stable but isn’t going to be as precise with feedback. It’s much like the Hyundai Elantra, where there’s a disconnect between the car and the driver. It’s also not as comfortable as the Honda Civic, which provides seats that feel larger and offer more support. A 2.0-liter four-cylinder gasoline engine that produces 147-hp. The Kia Forte has an interesting range of engines, and all three trims do a pretty good job of being fairly comprehensive. The LX and S trims come standard with a 2.0-liter four-cylinder gasoline engine that produces 147-hp. The 2.0-liter four-cylinder gasoline engine in the ‘EX’ trim produced 164-hp. Though the output isn’t amazing by class standards (the 2.0-liter four-cylinder gasoline engine in the ‘EX’ trim produced 164-hp), this less powerful unit does boast better fuel economy figures of 25mpg city/34mpg highway for versions fitted with the manual transmission, and 29mpg city/38mpg for six-speed automatic models. In comparison, the more powerful 2.0-liter that’s only available with the six-speed manual can return 25mpg in the city and 33mpg on the highway. The Kia Forte was awarded the full five stars in its most recent crash test. Unsurprisingly the Kia Forte got a 5-star overall rating from the NHTSA , thanks to Kia improving the car’s structural rigidity in the front, earning the Kia Forte a 4-star rating for frontal collisions. The Kia Forte comes with some interesting safety features, and more interesting options. Standard equipment includes anti-lock brakes, traction control and stability control, with examples of optional safety features being automatic emergency braking and lane departure warning. With such equipment on board, it’s unsurprising that the Kia Forte was awarded the full five stars in its most recent crash test. One undeniable quality of the Kia Forte is its value. 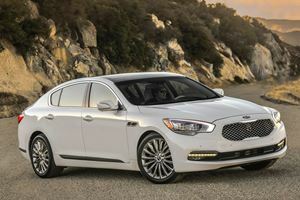 The base model is priced cheaper than the competition at around $16,600, sliding just behind the Ford Focus at $16,775. The amount of active safety features available for the Kia Forte is impressive, especially when considering how much cheaper it is compared to cars with similar safety features like the Hyundai Elantra, which starts at around $17,150. It’s a tough choice between all three trim options that are offered for the Kia Forte, but we’d recommend either the S or EX trims. To get all the features on the Kia Forte brings the price to around $26,800 while the same features in the Hyundai Elantra bring the price up to around $27,600. It’s a tough choice between all three trim options that are offered for the Kia Forte, but we’d recommend either the S or EX trims. The S comes with sport-tuned suspension but the EX comes with the more powerful engine and slightly larger wheels and tires. The good news is, no matter which trim is picked Kia has done a stellar job at keeping the car affordable. While the base LX model cannot come with any packages, the S and EX have their own premium packages. Each premium package comes with the optional safety features and various conveniences like a power sunroof and heated seats with leather trim. On paper, the Kia Forte looks like one of the best cars in this class. It’s got decent handling, okay engine power delivery with good fuel economy, a good amount of safety features, seats five people, has ample trunk space and offers good value for money. 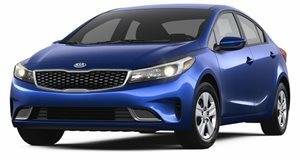 Unfortunately, the Kia Forte noticeably suffers in areas such as ride quality ride quality and general performance that don’t affect the more accomplished cars in this class as much. Still, the Kia Forte is a solid and basic choice that isn’t necessarily the wrong choice if it suits your needs, but we’re more inclined to recommend other rivals over the Kia Forte if you’re looking for a new compact sedan. No tears will be shed.